If you are cutting shapes or straight cutting, this section will explain the best width blade for the type of cutting being done. 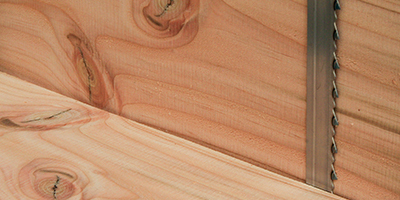 The best tooth pitch will depend the thicknesses being cut, importance of finish. This section explains the options available. The thickness that the blade is made from can be very important, this section gives all the information on the thicknesses of the different types available. This section explains the differences between the various blade types available. Some ranges can suit different bandsaws better than others. 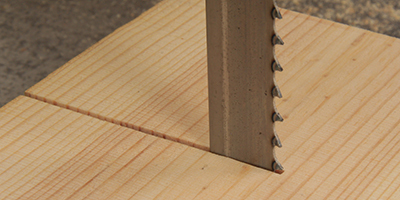 If you want to cut metal on your bandsaw, this section is an essential read. 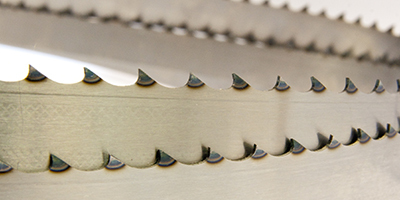 Fast cutting thicker stock – find out which are the best blades. Blades made from thinner material with minimum set on the teeth to help keep waste to a minimum. 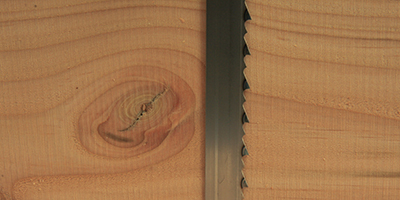 Some blades can be used for a wide variety of cutting, here we look at the various options. 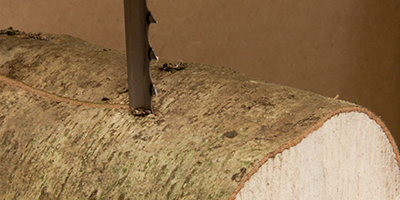 Whether it’s cutting green wood or seasoned wood, we’ve got a suitable blade. 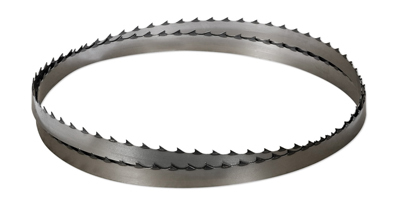 With over 25 years in the saw industry, including working in bandsaw blade manufacturing, we are able to bring you the highest quality bandsaw blades available on the market today. Unlike some other companies, we don’t charge any extra for non standard blades so if you are having trouble finding good quality blades to fit your bandsaw, please do not hesitate to contact us. 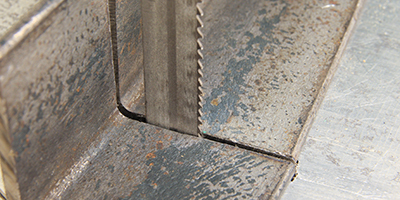 If any of the blades that Tuff Saws sell break on the weld then just return the blade to us and we will re-weld the blade free of charge. If you are not happy with any blade purchased from Tuff Saws, just get back in touch and we will do our utmost to resolve any problems. 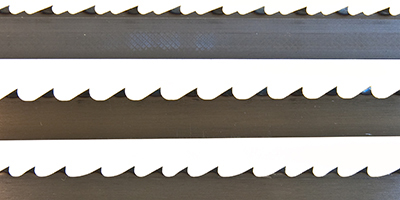 Not all bandsaw blades are the same and a good quality blade can transform the way that your bandsaw works. 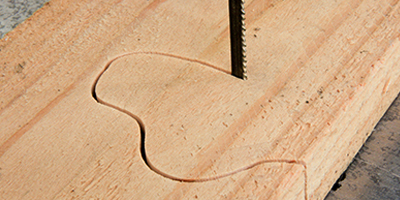 With the correct blade the bandsaw can be a joy to use. The bandsaw is such a versatile machine and every workshop should have one but , unfortunately, most people’s perception of the bandsaw is spoilt by the low quality blades that are generally supplied with the machine. All blades are made to order and we take the utmost pride in making sure that we only sell the highest quality blades available. You can have an excellent quality blade but if it's not welded properly then it's a waste of a blade. We have spent many years perfecting the art of welding and, more importantly, annealing bandsaw blades in order to supply the highest quality blades possible. What ranges are suitable for my Bandsaw? The width of the blade determines the type of cutting that you can do. Generally, narrow blades are used for radius cutting and wider blades for straight cutting. The narrower the blade, the tighter the radius that can be cut. 1/8” and 3/16” blades tend to be used for cutting very tight radiuses and 1/4" blades are the most common width for radius cutting as most machines are set up as standard to take a 1/4" blade as the narrowest blade that it can use. Generally adjustments to the guides will have to made to run anything narrower than 1/4". 3/8” blades are very popular for cutting bowl blanks and with instrument makers for radius cutting thick stock etc as a 3/8” blade will have more beam strength than narrower blades so will cope better with thicker stock. A common misconception is that to cut thick stock, you need the widest blade possible that will fit on your machine, but this is not always the case. 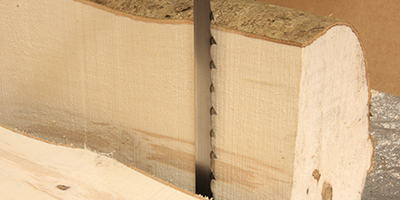 Most bandsaws will struggle to tension the widest blade that the manufacturer claims will fit on their machine so you either have to use a narrower blade or one of the SuperTuff Premium, SuperTuff Sabrecut or Fastcut blades which are made from thinner material. (In the Sabrecut range the 1/2" is standard thickness but the 5/8” and 3/4" are made from thinner material than standard blades). Even though a wide blade will seem to fit ok, the machine can struggle to tension the blade sufficiently for optimum performance. Because the SuperTuff Premium, SuperTuff Fascut and wider SuperTuff Sabrecut blades are made from thinner material than standard blades, this will eliminate the tensioning issue – standard 5/8” blades are made from .032” thick material, whereas the SuperTuff Premium and SuperTuff Fastcut are made from .022” thick material, which is thinner than a standard 1/2” blade. The wider SuperTuff Sabrecut blades are made from .025” thick material. I have been running 5/8” SuperTuff Premium, SuperTuff Sabrecut and Fastcut blades on machines that take 73” and 82 1/2” blades with no problems. 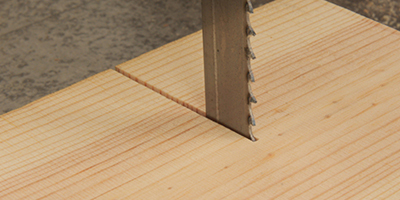 For straight cutting 1/2" and wider blades tend to be used.